It begins with #11 and ends with #61, with #1-10 as the introduction and summary and #51-61 also serving as a conclusion. Luke has 77 names —the number of forgiveness — from Jesus to Adam “the son of God”. The names after David differ from that of Matthew’s genealogy due to another method of tracing the lineage of Jesus. Interestingly, these names recorded by Luke (from “David” on) do not form a names-bible-code as does Matthew’s list, but when attempted reads as gibberish. This only underscores the miracle of Matthew’s list of names. Nor can it be said that Matthew deliberately invented these names in order to artificially create this code because it is Matthew (not Luke) who follows the names of the kings of Judah as recorded in the Old Testament centuries before Matthew was born. Only the last 10 names in Matthew’s genealogy are not found in the Old Testament. This is because the Old Testament ceased to be written during that period. Thus, only about one-eighth of the names in the Names Bible Code are supplied to us by Matthew while the rest are already found in the Old Testament. And if we say that the numerous Old Testament writers somehow over a period of hundreds of years conspired to create the Names Code, then we are still left with a prophecy about Jesus the Messiah written hundreds of years before he was born. How much more logical to simply accept this code as a miracle of God! King David is at the exact middle of the genealogy, which is interesting because the bible calls Jesus, “The Son of David” nine times and “The Son of Adam (man)” בן־אדם 88 times. Jesus is linked to King David and Adam more than any other in his ancestry. We have numbered the following according to Matthew’s reckoning, except we include the five missing names, here listed are #39a, 39b, 39c, 46a, 48a. 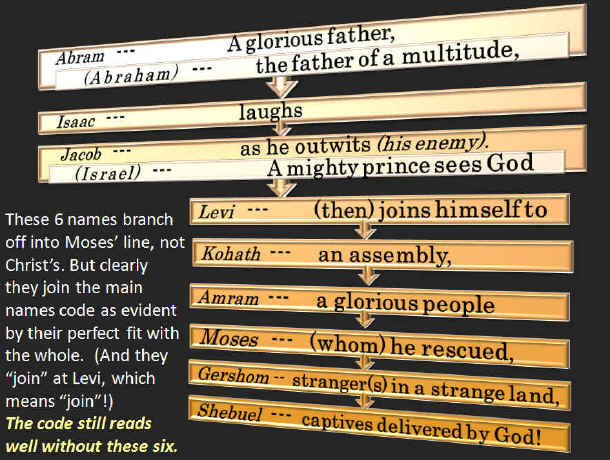 The omitted people in Matthew’s genealogy are nevertheless recorded for us in the Old Testament. Thus, the following represents the complete list of names found in the Bible, from Adam to Jesus! “And”, “but”, “of”, “the”, “is/are” are included in the meaning as mere connector words. Other additions are bracketed. The notes concentrate on the more difficult meanings. The names for the “Lord” in Hebrew are “Jah”, short for “Jehovah” (“Yahweh”). “Appointed”, “placed”, “put”; “compensation”, “to replace”. “The Praise of God”; “The Fame of God”; “The Glory of God”; “The Blessed God”. (The Messiah is “the Glory and Praise of God”, Heb. 1.) Note the contrast of the fame/Glory of God here with the fame of Babylon in #11-12. Also, #5-10 is being contrasted with #11-15. “Man of the missile/dart”; Sounds like, “His death shall bring”. The latter reading is the more obvious (though not according to etymology) in that “His death brought” the flood; that is, Methuselah died just weeks before the flood. Nevertheless, even the name “Man of the dart/spear” suggests the type of death that Messiah would die, for “He was pierced for our transgressions,” (Isa. 53). Also compare Methuselah to his ungodly counterpart, Methushael, which sounds like, “His death is of God,” and likely literally means, “A Man who is of God”. (See next chart and also endnotes.) The two similar sounding names help decipher the intended meaning in the code because in both lists the idea of “His death” is present and fits the context. “Grieving”, “poor”; “the strikerdown”, “overthrower”; “the wildman”; “a strong youth”; “powerful”. These are all possible meanings, but none are certain. What is for sure, however, is that the name sounds like the Hebrew phrase, “Lamech”, meaning, “To sink down in despair”, and so it is rendered here. (Also see endnotes for names as puns.) The name also sounds like, “Concerning him who was smitten”; see Psalm 136:10. Gen. 5:29 “And he called his name Noah, saying, This [same] shall comfort us concerning our work and toil of our hands, because of the ground which the LORD hath cursed.” This is a good example of how a name can mean one thing by strict etymology, and yet the bible applies another or like meaning to it taken from another, but similar, root word. Strictly speaking, “rest” is what “Noah” means, but the Hebrew word for “comfort” sounds similar in Hebrew and means much the same, and this is the meaning chosen by the bible. “Stronghold of Babylon”; “Boundary of Babylon”; “Wall of Babylon”; “(City of) Ur of Babylonia/Chaldees” “Healer/Releaser”. Sounds like, “I will abandon Babylon”; or, “I will make Babylon sink down/fade away”, or, “He cursed the breast”. This is a key name, and nearly all the possible meanings fit well and have been included. While there are several different possibilities, there is increasing agreement among scholars that the name refers to Babylon in some way. (See endnote quoting from “The Jewish Encyclopedia” concerning its connection with Babylon.) This line of names that reads, “The fame and/of the stronghold/boundary of Babylon extends beyond the border/divide,” ends with Peleg and this is also where the genealogy branches out into the period of the tower of Babel. Babel is also where they sought to make a “name” (fame) for themselves. Therefore, perhaps the “stronghold of Babylon,” is just another name for the “tower of Babel” in Babylon. (Or may read, “I will make Babylon sink down/fade away!”) I believe both are intended as a play on words, and this is reflected in the code. “The region beyond”, “The other side (of the river Euphrates)”, Gen. 11:31.
of division (at the tower of Babel). “Division”; “watercourse”; “water channel”; “divide”. Peleg is a play on words for many things here, including the division at Babylon, Gen. 11:9. Perhaps it is also a subtle reference to the Euphrates river which acts as a border for Babylon? (See the previous name.) The name carries with it the idea of a divider or division (as at Babel), as by a river. The meaning agrees with his father, Eber. Eber (region), plus Peleg (divided), means, “A region divided”. Recall the events at the time of Peleg. “Exalted father”. Abram had his name changed to Abraham, meaning, “Father of a great multitude”; “Father of many”; sounds like, “father of mercy”. It is interesting that both names here are Babylonian, since Abram was called out of Babylon. Some scholars believe that Abraham derived its meaning more by what it sounded like to Hebrew ears rather than actual etymology. Some suggest that the actual etymology for Abraham means, “he loves the (his) father,” but that it only sounded like, “Father of a multitude” to Hebrew-speaking people. (International Standard Bible Encyclopedia.) But rather than speculate, we have gone by what the bible expressly says in Gen. 17:5, “Neither shall thy name any more be called Abram, but thy name shall be Abraham; for a father of many nations have I made thee.” Nevertheless, this is likely another example of how some names have their meaning, not in their true etymology, but rather in what the name would sound like to the Hebrew ear. (Also see endnotes for names as puns.) Some of the names before Abraham are also Babylonian, and this methodology for deriving a name’s meaning appears to be the case for a few of these names, such as Arphaxad and Cainan. “He laughs”; “Laughter”; “He mocks”. (The word implied a triumphant laugh, especially in the context of the code. God is mocking his enemy. as He outwits (his enemy)! A righteous Prince sees God! Jacob/Israel are both difficult to decode because there are layers of meaning that the bible itself alludes to. All are intended! 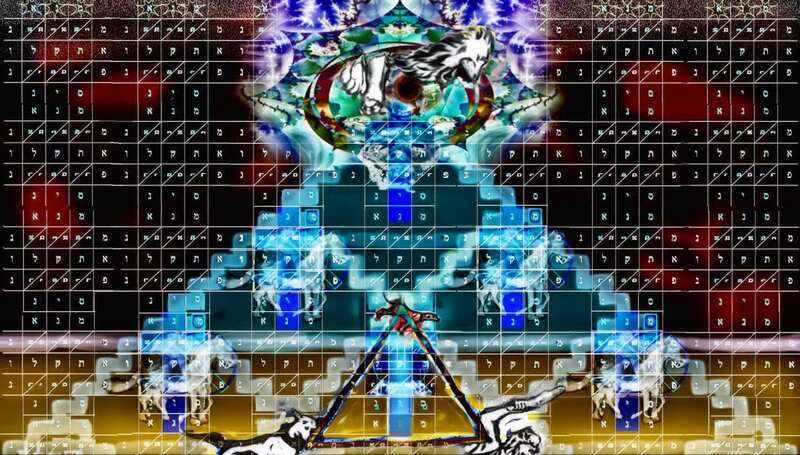 But this complexity is fitting considering the importance of these names, for both names represent the nation to which the code speaks, as well as the person. (See note for #58.) I have used the compilation of each name, that is, a composite meaning that attempts to capture the several meanings. Gen. 32:25-27 “And when he saw that he prevailed not against him, he touched the hollow of his thigh; and the hollow of Jacob’s thigh was out of joint, as he wrestled with him. And he said, Let me go, for the day breaketh. And he said, I will not let thee go, except thou bless me. And he said unto him, What [is] thy name? And he said, Jacob.” Gen. 32:28-30 “And he said, Thy name shall be called no more Jacob, but Israel: for as a prince hast thou power with God and with men, and hast prevailed. And Jacob asked [him], and said, Tell [me], I pray thee, thy name. And he said, Wherefore [is] it [that] thou dost ask after my name? And he blessed him there. And Jacob called the name of the place Peniel: for I have seen God face to face, and my life is preserved.” (Also see Hosea 12:3-4, “Jacob took his brother by the heel in the womb, and by his strength he had power with God: Yea, he had power over the angel, and prevailed: he wept, and made supplication unto him: he found him [in] Bethel, and there he spake with us”.) The code picks up again on the theme of intercession in #48. “Israel” also sounds like, “The upright one”. This too is reflected in the code. The bible alludes to what the name Israel sounds like, “Isharel”, meaning, “God is righteous”, in Num 23:10, “Who can count the dust of Jacob, and the number of the fourth [part] of Israel? Let me die the death of the righteous, and let my last end be like his!” The nation “Israel” is even given the honorary name of Jeshurun (Dt. 32:15; 33:5,26; Isa. 44:2), meaning, “the upright one”. The International Standard Bible Encyclopedia (ISBE) says, “Most moderns take it as a poetical or ideal title of Israel, derived from ישׁר, yāshār, “upright”; it is held to contain a tacit reference to the word Israel (ישׁראל, yisrā’ēl), of which the first three consonants are almost the same as those of “Jeshurun”'”. From “Israel” to the grandson of Moses. Compatibility: The line of Moses runs through Levi, but the line of Jesus runs through Judah. Thus, their genealogies branch apart after Jacob. However, when the genealogy of Moses is followed to its conclusion, (if inserted) it joins and flows perfectly with the rest of the Names Code of Jesus. The remarkably compatibility of these two distinct genealogies with each other prophetically points to Jesus as another Moses-type savior. But this “insertion” is optional because if the six names are left out, the remaining 72 literal names in Jesus genealogy still read well without them. But the code is enriched with them, and their compatibility argues for their inclusion as something intended by God. Compare this portion of the code, “Praise/A confessor of Jehovah breaks forth and opens a way into a place that is surrounded by a high wall where the people of the prince are safe from the false prophet, being clothed with strength”, with Num. 10:14, where the tribe of Judah leads the way from Mt. Sinai ahead of all Israel with the wall of fire by night, led by Moses the righteous prince. Therefore, Moses is the “mighty one” who “intercedes” and “sees God” at Sinai in #22, as did Jacob/Israel at Peniel, and who “outwitted his enemy” (#20-22), Pharaoh, at the Red Sea. There, Israel rejoiced, laughing and mocking their enemies in song and dance — Pharaoh and the false prophets (#28) (magicians) were disgraced, along with the false prophet, Balaam, 40 years later. “Court”; “village”; “enclosed area by a wall”; “enclosed”; sounds like, “blooming”. Perhaps alluding to the pillar of fire that protected the Israelites, and to the “wall of water” at the Red Sea crossing, and ultimately to the New Jerusalem “having a wall great and high”, (Rev. 21:12). Note that the main opening/”gate” in the “high wall” is Judah, as implied by the position of the 12 tribes around the ark of the covenant in the day of Moses when they camped, (i.e., Judah/”praise” would be the main middle gate facing east.) Note, “the glory of God coming down from heaven” and #5-6. Also see #29. “High”; “exalted”; “elevated”. (1Chron. 2:10-12.) See the “New Jerusalem”, “having a wall great and high”, (Rev. 21:12). (See previous notes.) Note Rev. 22:14-15 and “false? prophet” of #28? “My people of nobility?”; “My kinsman/people are noble”; “Kindred of the prince”; “People of the prince”; “My people (or my kinsman) is generous, or noble, or willing”. Amminadab was a prince of the tribe of Judah (Num. 7:12) who lived at the time of Moses and likely saw the Exodus. Perhaps the word “Prince” in the code is meant to remind us of Moses who was called a Prince, and thus the high wall of #25-26 perhaps alludes to the pillar of fire that led Israel in the desert. Positively speaking, Nahshon sounds like and is related to the word for “Nehushtan”, and Num. 2:3 about Nahshon as “The Prince of the people of Judah,” — the word “Prince” literally means, “to be lifted up”; and, Nehushtan is the name for the ‘snake on the pole’ that was “lifted up” in the wilderness for the healing of the people of which Nahshon himself would have witnessed. Perhaps, then, Nahshon is also a type of Jesus lifted up on the cross (John 3:14) in the sense of the snake upon the pole? I believe Nahshon can, therefore, be viewed positively and negatively — as Christ or antichrist — but since the literal meaning of the name itself lends best to the latter, this is what I have put in the names code. (2Kings 18:4 “He removed the high places, and brake the images, and cut down the groves, and brake in pieces the brazen serpent that Moses had made: for unto those days the children of Israel did burn incense to it: and he called it Nehushtan.”) Thus the names would read: “The people of the Prince of the Snake on the Pole are safe…” Also note Rev. 22:14-15. “Serving”; “worshipping”; “A servant”; “A worshipper”. This name marks the middle of the 60 names and it also marks a subtle shift in who is speaking — apparently, (as I interpret it), moving from God the Father to now God the Son. The name Obed (“servant/serving”) applies equally well to both the previous thought and to the next thought, and I have gone with the latter. 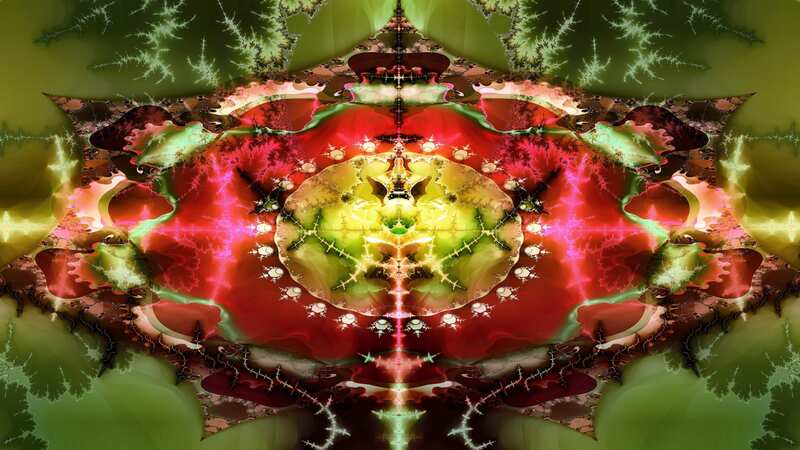 However, one can choose either or without significantly altering the flow of thought. 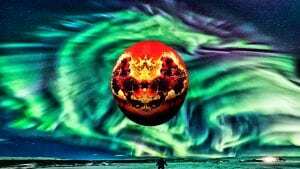 It is perhaps significant that of the 6 days of creation, the first 3 were days of forming and the next 3 were days of filling what was formed. This seems to be the pattern of the 30 + 30 names here. If so then #1-4 is in parallel to #31-35. (King David is at the center of genealogy.) The name means: “Beloved One”; “loving”. “Peaceful”; “peace”; “peaceable”; “wholeness”. Sounds like “His peace”. If placed in the intensive form sounds like, (piel, inf., absol. ), “His retribution/repayment/reward”; “making his amends”; “making amends for him”; “repaying him”. The idea is to ‘make peace/complete by making amends’, and so, “His amends brings peace”, captures the general sense the best. See king Shallum, (meaning, “retribution”), in Jer. 22:11, and notes on Josiah, #46. Also, Ps. 91:8; Isa. 34:8 in Hebrew. and sets the people free! “Enlarger of the people” (be number and/or territory); “The people is enlarged”. “One who opens wide a place for the people”, but the extended meaning can imply, “One who sets the people free, (i.e., relieves them from their confined space)”, as in Ps. 4:1; 118:5. Compare with #’s 24-25; hence, the thought is, “He will set the confined people free by bringing them into a spacious land.” However, for argument’s sake, even the root meaning of, “One who extends (the territory/number) of the people” reads well enough by itself. “Worshipper of Jah (Jehovah)”; “Father of Jah”; “Jah is father”; “My father is the Lord”. “The Lord has judged”, “The lord is judge”; “He whom the Lord judged”; “Whom the Lord judged”, (can imply, “the one whom the Lord pleaded for”). and whom the Lord raised up! These 3 (wicked) kings (Ahaziah, Joash, Amaziah) are omitted in Matthew’s genealogy although they are part of the ancestry of Jesus. (Matt. 1; 2Kings 8:24; 1Chron. 3:11; 2Chron. 22:1, 11; 24:27.) Notice the redundancy, yet how symmetrical these 3 names are. Thus, these 3 names can be added or taken away without any loss of meaning, only of emphasis. Ahaziah – “Yah holds, or sustains”; “Held by Jehovah”; “Jehovah (Yahu) holds (possesses)”; “Jah has seized”. and the Lord is strong! Joash (same as “Jehoash”) – “Jehovah is strong” ; “Jehovah has bestowed/given”; “Yah has laid hold”, “substance/existence of Jehovah”; sounds like, “Jehovah is (like) fire”; “Jehovah is a man”. It begins with #11 and ends with #61, with #1-10 as the introduction and summary and #51-61 serving as a conclusion. My strength and help are in the Lord! 2Kings 14:21 – Uzziah is also called Azariah, 2Chron. 26:1. The former signifies, “My strength is the Lord”; the latter, “The/My help (is) of the Lord”. Our rendering is a compilation of both. “Jehovah is upright”; “Jehovah is perfect”. “He has grasped/seized/taken hold of”; “One that takes or possesses”; “helper”. “Strength of the Lord”; “Whom Jehovah has strengthened”; “Strength/might of Jehovah”. and it made (me) forget (my misery). Sounds like, “Amen! (truly! )”; “faithful”; “true”. “Founded by the Lord”; “Whom Jehovah heals”; “Healed by Jehovah”; or “Jehovah will support”. (Both “Supported” or “healed by Jehovah” would work in the code.) “Jehovah supports him”; “Given of the Lord”. Josiah’s son “Shallum” (Jer. 22:11-12), (meaning, “retribution”), died in Babylon and his brother, Jehoiakim, reigned in his place. “Jehovah raises up”; “The Lord will raise”; “The Lord will establish/set up”; Also called Eliakim which means much the same, “Whom God will raise up”. 2Kings 23:34 “And Pharaoh-necoh made Eliakim the son of Josiah king in the room of Josiah his father, and changed his name to Jehoiakim…” Thus, the two names together mean, “The Lord God raised up”. and whom the Lord upholds, will uphold and did uphold! Since this king had three similar names, I have taken the three main meanings and combined them. The context sometimes determines tense in Hebrew. This king had three names that are basically the same, two of which are exactly the same except for the one being future (or continuous present) and the other being past tense. The third name (Jehoiachin) can be future or continuous present, and I have rendered it as a present tense as perhaps suggested by the changed word order of the divine name to that of Jeconiah, and because two future tenses would be redundant. See Rev. 1:8, “I am Alpha and Omega, the beginning and the ending, saith the Lord, which is, and which was, and which is to come, the Almighty. “I have asked God (about)”. “Jehovah has ransomed”; “Redemption of the Lord”; “Whom the Lord has delivered”. (about) the seed (exiles) in Babylon. “My father is majesty/glorious”; “father is majestic”. will the Lord raise up! “The Lord will establish”, “The Lord will raise up”. My God is my praise! “Help of God”, “God has helped”, “God is helper”. “Gift”. (The word “may” actually belongs to #59, but is inserted here for the aid of the English reader. Literally, these three names in Hebrew read, “The gift of Jacob, let it increase!” But that is not how we speak in English!) (Gill’s commentary, “…and said, the Lord shall add to me another son: which is expressive of strong faith; that as she had begun to bear children, she should bear another, as she did; though some read the words as a wish or prayer, “may the Lord”, or, “and that the Lord would add”, &c. (h); but our version seems best.” Nevertheless, the context of the code with #48 here favors this as indeed a “prayer” said in perfect faith. This is the second place that Jacob occurs in the genealogy. The first time it was the Jacob who was renamed, “Israel”. But here, I took “Jacob” to symbolize this first Jacob, that is, “Israel” and the nation. Out from this genealogy of fallen men (epitomized by “Jacob, the deceiver”), comes the “Gift” of God that redeems man from the curse brought on by the serpent, the original Deceiver in the Garden of Eden. Satan “grasped” and thereby “bruised” the heel of Jesus, but by doing so, God crushed the head of the serpent under his foot and thereby redeemed man. “He will add”; “Increaser”, “Let him add/increase”; “Remover”. Also named, “Emmanuel”, meaning, “God is with us”; and “Christ”, meaning, “Messiah” = “Anointed one”. “Those called out” (i.e., out of the World/Babylon). In a very real, but spiritual sense, the church of believers was “birthed” by the Spirit of Jesus at Pentecost, Acts 1. This is in agreement with Isaiah the prophet, “Yet it was the Lord’s will to crush him and cause him to suffer and though the Lord makes his life a guilt offering, he will see his offspring and prolong his days…, (Isaiah 53:10 NIV). Moreover, in AD 70, a generation (40 years) after Jesus’ rose from the dead, Jerusalem fell to the Romans thereby (for a time) ending an era. The following is the composite list of the meaning of the 8 (10) names in the genealogy from Adam to Jabal along Cain’s line. (Note the similarity between these names and the first 10 names along the godly line of Seth’s in above chart. The similarity suggests that the ungodly line was mimicking the godly line. It also suggests that the list is selective, perhaps implying a hidden message.) Keep in mind that this is the ungodly line. It appears that the death of Messiah to them brings about the deepest of sorrow. O’ offspring of the man brought forth! his death is of God. Over a dozen sources were used to dig into the meaning of these names, many of which are found in the E-Sword free software. The classic and monumental works of “Brown Drivers and Briggs Hebrew and English Lexicon” and “The International Standard Bible Encyclopedia” were the main resources, also free over the internet, and therefore others can verify the names for themselves. Matthew omits five individuals, and thus our chart shows 60 persons, with the five omitted names listed as #39a, 39b, 39c, 46a, 48a. The number “60” symbolizes a “perfect man”, (10-‘perfect’, 6-‘man’). Not including the questionable LXX, “Cainan”, from Adam there are 32 generations to the birth of King David and from King David to the birth of Jesus are another 32 generations; 64 generations in all, but 65 individuals with David at center as the 33rd. The number “64” is 8 x 8 generations and in the bible “8” is the number of new beginnings, appropriate for Jesus’ birth. And “65” is the number of shattering (Isa. 7:8), appropriate for Him who died on the cross. As said earlier, the Names Code itself totals 80 names in all. The number “80” is the number of “a perfect new start”, (10-‘perfect’, 8-‘new start’). For “72 names”, see Luke 10:1, and notice that different translations have “70” or “72”. For further notes about the Names Bible Code, click here. 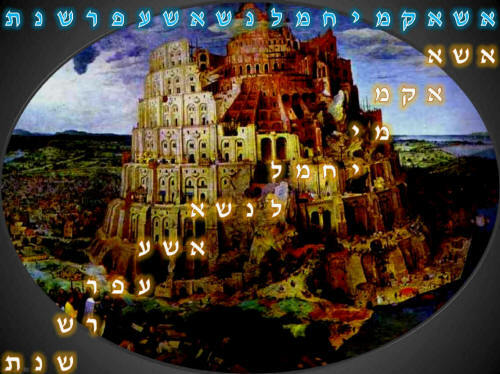 Tower of Babel Acrostic Bible-Names Code. If reproduced, please provide hyperlink back to this page.